Notes: Turner D8. Dixon #58. Bar Rep 53. Butler Vol. 1. Map 8.6 (diagram Vol. 5. p.179). Grinsell MANATON 13. "A ring cairn surviving as a mound 6.5 metres in diameter and 0.15 metres high. It is defined, except on the west side, by a ring of at least 19 close set granite stones. 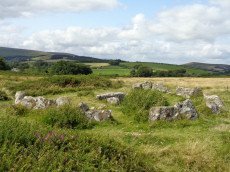 In the centre of the cairn is a north to south orientated cist, with both end stones and the western side stone remaining visible."